1) Invariably mommy’s sick day will happen on the weekend. Seriously?! God definitely has a sense of humor. Otherwise he would have made me sick on a day when the children are away for six hours! 2) God bless Husband from Heaven, but he’s no match for the Tasmanian Devils that I gave birth to. He did his best to have them keep the house clean, but when the mommy emerged from the “cave of feeling crappy” it looked like a Trifecta bomb had gone off in the kitchen. Lucky for them I had my “I feel sh*tty so I can’t see anything” goggles on. It wasn’t until the next day I realized what had actually happened. 3) The day that you decide to be sick will be the same day that your children decide they need to get all of their USRDA of vitamins for the next 6 weeks. The children never eat their vitamins (mostly because their bad mommy forgets to give it to them – I don’t even eat my own vitamins, how am I possibly going to remember to give them theirs?!) And yet, the one day I am sick they decide to polish off the entire bottle of gummy vitamins! SH*T!!! We did call poison control, but those things had been in the pantry so long, the worst they were probably going to do is give the baby a bad stomach ache – according to her sisters, she ate FIFTEEN while they only ate three. This is when the bubble over my head says “uh huh!” You can add that to my mother of the year award application! Despite still not feeling great, mommy decided to have the Ego (middle child) be Santa Lucia because today (December 13th) is Santa Lucia Day in Sweden. 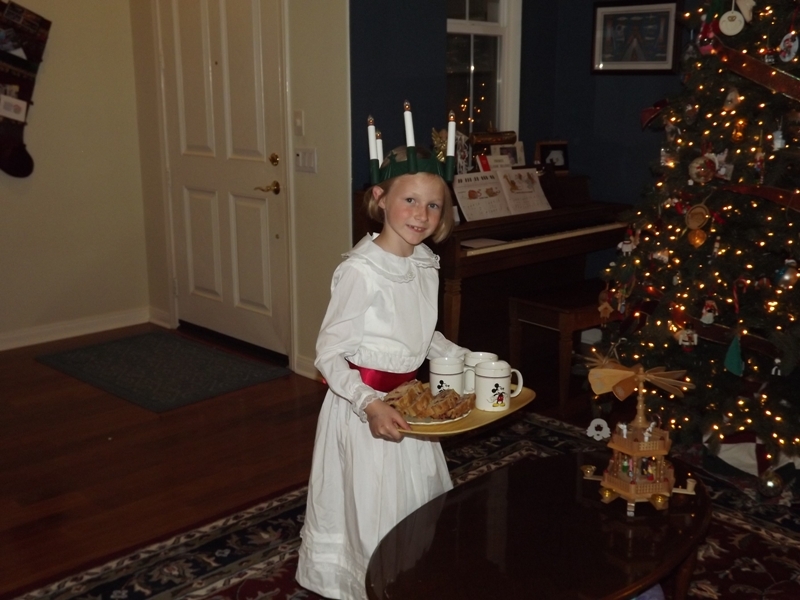 This is a holiday where a child wears a white dress and wreath of lights and brings bread and "coffee" to the family. There's more to the story that involves burning at the stake and martyrdome, but you'll just have to google it, this post is already too long. :-) Of course, you're supposed to do this little tradition in the morning, but we did it right before the girls went to bed because . . . we're not in Sweden and mommy needed more time to bake the bread. The best part, mommy killed two birds with one stone because the bread provided was today's cranberry project. Pamela's Gluten Free Bread Mix - make according to sweet bread recipe. Double the amount of sugar suggested. Add 1 cup of cranberries (cut in quarters) and 1 cup of crushed walnuts just before putting in the bread pan. Cook for an hour at 325.